Great place to feel the Carribean nature and sun! A huge swimming pool invites you to relax and enjoy your stay at this tropical paradise. An open lounge designed to please your eyes. What about a comfortable living room to gather with your friends? A light bedroom for sweet dreams. A pefect spacious and sunny area to have a party. An open terrace with a seaview will let you enjoy serenity and peace of the beach paradise. Picturesque landscapes won't leave you indifferent! A quiet cozy place to talk with a friend or read a book. Enjoy the sophisticated design and impressive views of the bedroom. Amazing bathroom with modern design and all the amenities provided. Spacious bedrooms with large comfortable beds for your sweet dreams! Clean fresh linens, soft mattresses and pillows will provide you with comfort and make you feel at home. How nice to start the day in a stylish bathroom with a large mirror! The design and decor elements contribute to the peaceful atmosphere of the beach villa. The sea-style design highlights the beauty of the beach and the ocean just a few steps away. A spacious dining area with a table for 6 people allows you to enjoy the food you prepare. The bathrooms are a perfect combination of style, cleanliness and amenities. There are enough beds to accommodate a large group! What time is it? Even the wall clock is made in the marine style. The peaceful atmosphere of the villa will help you to relax and gain strength. Here, each piece of furniture is specially selected to create a unique atmosphere. Clean bathrooms, hot water, a set of towels and basic amenities for each guest. Blue and white cushions emphasize the Marine style design of the common areas. It is impossible not to feel at home in such cozy bedrooms! Style and usefulness in tiny details. Every corner has something new pleasant to your eye. Sea, sky, flowers - nature and harmony are in every detail. It is an ideal place for those who are looking for comfort and privacy. Everything is created to make you feel our care about the guests! You will love to cook breakfast in the spacious fully equipped kitchen. What about inviting your friends for a dinner you prepare in this kitchen? A dining room is full of natural sunlight. Cutlery and crockery that you need at your disposal. You will love spending time together outdoors on our spacious terraces. One more corner to enjoy the quietness of the place. Great location near the beach giving privacy. Comfortable armchairs for the afternoon rest. Feel like never before on this spacious terrace. Great accommodation to enjoy nature and your loved ones. Enjoy the beautiful ocean and first class beach every day - it's really close. Here you will get a calm environment and complete safety. Great outside view of this villa! Pool terrace allows you to relax with comfort! We have a fun place for your child too! Playground area right on the beach is designed for active and curious children. A new view from every balcony. Comfort and style meet here. What about a stylish stone-like sink? What a view! The sea and the palm trees make a wonderful scenery you can observe right from the balcony. Located only 1 minute away from the World-famous beach, with a private pool in the complex. The maid services, cooking and cleaning – included! Discover pool views, decorated with bright colors, beautiful furniture, and large windows, includes free WiFi, cable TV, AC, washing machine, barbecue area, balcony with a stunning ocean view, modern kitchen with stainless steel equipment. Enjoy the famous beaches in the World steps from you in the luxuries retreat of this area! The villa is secluded by the tropical style gardens that add privacy, but you can still hear and smell the ocean. All the bedrooms have walk-in bathrooms with a unique modern design. Just enjoy a refreshing shower after spending the day in the sun. Spend an enjoyable evening with your friends or family in the living room or in the patio, making barbecue, chatting or sipping cocktails. Do you prefer cooking your own meals? Then our fully-stocked kitchen is for you. Everything in this villa is designed for your maximum comfort and ease of mind. Just have a great time and enjoy it! This villa is absolutely private and designed only for you. There is a maid, working for the cleaning. …and much more for you just to feel like a home away from home! There is a gorgeous residence pool just if you get tired of the ocean (which is 1 minute away). Upon your arrival, our assistant will check you in and take care of all your needs. We organize everything from excursions to private events, and a transportation. Let us know about your priorities. And we have the best secret options for your vacation. This a super cool place to spend time with your family or friends. The tranquility of the space and the area will just make you fall in love with the place. Just look at the photos! 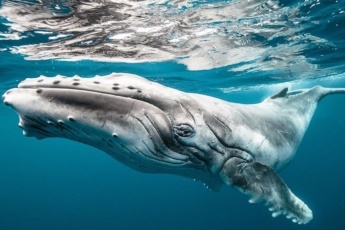 They are real, but everything is better in real life and worth seeing it with your own eyes! The villa is located in a luxurious residence Balcones del Atlantico, in a very tranquil and great place in Las Terrenas. This is a truly paradise spot to enjoy the beauty of the Dominican nature. The best place to relax. The beach is outstanding with white sand and blue and warm water. The complex is very well kept and has lots of security, the beach is private and never crowded. There is a parking option at the residence, just let us know if you need the space. If you want to explore the area you would probably need a car and we can help you with that! The closest airport is Samaná El Catey International Airport which is around 40-minute drive away from the residence. Let us know your arrival information and we will organize your transportation! We fell in love with this villa. It is spacious, perfect for a big family. Located near the beach, that is great. There is a pool there and the place is very green. The bedrooms are stylish. when the next time we go to Punta Cana, we will definitely book the villa again. The experience of staying at this villa was really great! The location was perfect, just 1 minute to the beach which was excellent, and we felt really secure. 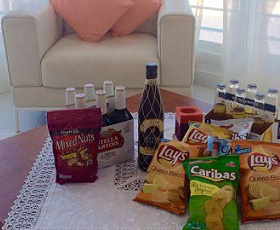 The host was really helpful and was open to everything we needed and was really cooperative and generous. The house was clean, very spacious and had everything we needed for a comfortable staying! Highly recommend this place in Las Terrenas, Samana!!! 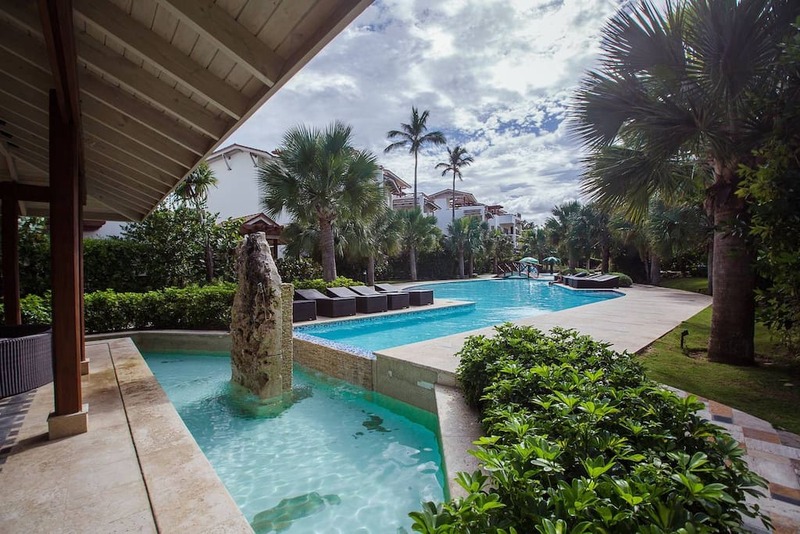 Where is the villa Los Balcones Del Atlantico situated: Samana or Punta Cana? 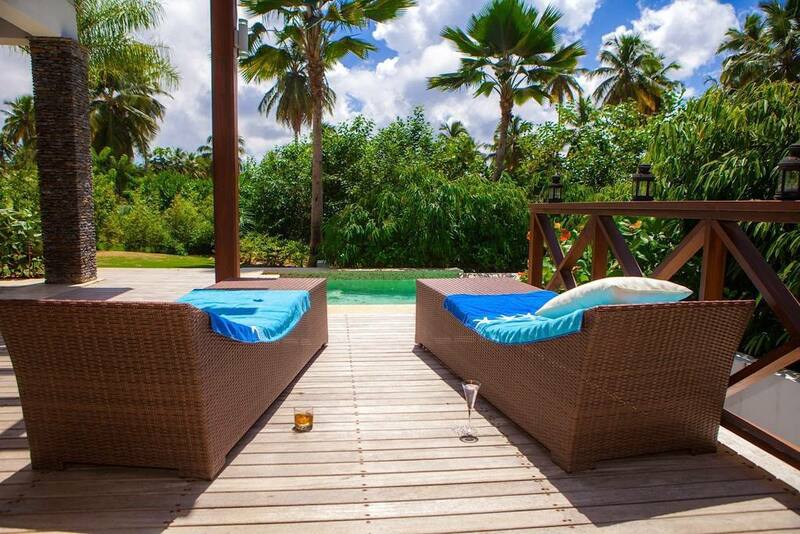 This Las Terrenas vacation villa is located in Las Terrenas, Samana. Samana is a picturesque part of nature in the Dominican Republic. How long does it take to get from Punta Cana to Samana? The distance between Punta Cana and Samana is about 310 km. It takes about 4 hours to get to Samana. If you would like to stay at our Samana ocean view villa, it would be reasonable to arrive at Samaná El Catey International Airport which is around 40-minute drive away from the residence. What is Dominican Republic weather? The weather in Dominican Republic is pleasant during the year and is about 30°C (86°F). Enjoy the sunny weather during your vacation at our Samana ocean view eco logde. Is this Samana ocean view condo a secure vacation rental in Samana? The complex, where our Samana ocean view villa is located, is very well kept and has lots of security. Is Las Terrenas vacation villa good for a romantic getaway in the Dominican Republic? Our Las Terrenas vaation villa is a perfect resort for honeymoon or romantic getaway dominican republic. It is located only one minute away from the beach in Las Terrenas - a picturesque part of nature in Samana, Dominican Republic. The beaches are not so crowded there like in Punta Cana/Bavaro. Enjoy your intimate getaway in Samana. Should I take US dollars or buy pesos in the Dominican Republic? Actually, there are many restaurants and shops where you can pay with US dollars in the Dominican Republic, but we recommend you to exchange something into pesos, just in case. Does this Samana vacation rental serve as a family resort? Our Las Terrenas vacation rental is a good choice for a company of friends or family. It it spacious and very comfortable. What is Samana Peninsula famous for? Samana Peninsula is famous for pristine beaches of white sands, crystalline turquoise waters and mountains full of coconut palms. The Samana Peninsula is famous for Playa Rincón beach and Las Terrenas - the main tourist center, Enjoy your vacation at this Samana ocean view villa in Las Terrenas. How to book Samana vacation package? You can book your Samana vacation package with a direct booking punta cana without any commission fee on our website, or find our property on Airbnb punta cana, Booking.com punta cana or Home Away punta cana pages and make your reservation. What if I have a problem o question during my stay at this Samana ocean view apartment? We provide personilized service Punta Cana and Samana. You will have a personal resort concierge, who will check you in and provide personal information and guidance. If you have a problem or question during your stay, do not hesitate to contact your personal resort concierge. He will also be glad to help you with the best Punta Cana excursion package or transportation. Is Samaná El Catey International Airport far from Las Terrenas vacation rental? The airport Samaná El Catey International Airport is around 40-minute drive away from the residence, where our Las Terrenas vacation rental is situated. At your request we can orginize transportation for you. Are there food spots and restaurants in Las Terrenas near this Samana ocean view villa? A restaurant and several bars are in walking distance from this Samana ocean view villa. We also recommend you to visit Restaurant Mi Corazon, Restaurant Le Thalassa, El Lugar in Las Terrenas. 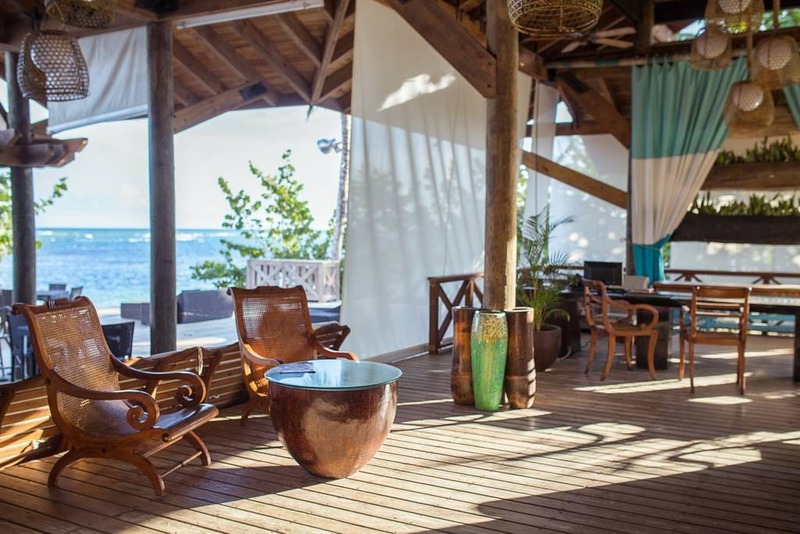 Does this Samana ecolodge have free WiFi? Yes, your vacation package at Samana ecolodge includes free WiFi. How many persons can this Samana ocean view apartment accommodate? Our Samana ocean view apartment accommodates up to 10 guests. It's a perfect vacation rental in Samana for a company of friends or a family. What are the airlines that fly to Samana? The airlines that fly to Samana are: Delta, American Airlines, Air Canada, WestJet, Air Transat.